US President Donald Trump has made it clear that he is willing to aggressively pursue American economic interests even at the expense of longstanding alliances, institutions, and values. This represents an about-face on decades of economic cooperation – and requires a strong European response. At his farewell speech at the State Department, Tom Countryman, the foreign-service veteran ousted from his post as top US arms negotiator, left an ominous parting shot for the Trump administration. “Business made America great, as it always has been, and business leaders are among our most important partners.” Then his tone shifted. “But let’s be clear: despite the similarities, a dog is not a cat. Baseball is not football. And diplomacy is not a business. Human rights are not a business. And democracy is, most assuredly, not a business.” His message was squarely aimed at both the White House and the new occupant of Foggy Bottom, Rex Tillerson. Countryman was warning about the new mercantilist nationalism that seems to have become palace doctrine for the Trump administration. This week, this doctrine will make its debut in Germany, as Vice President Mike Pence, Tillerson, Defense Secretary James Mattis, and Homeland Security Secretary John Kelly attend the Munich Security Conference. Indications suggest that, Tillerson – who will also be in Germany for the G20 foreign ministers meeting in Bonn – will function more like a glorified commerce secretary. The State Department will, of course, still tend to the consular duties, stability operations, conflict negotiations, and multilateral organizations that are the staples of diplomacy. But its core mission will include a more aggressive pursuit of the country’s own narrow geo-economic interests, the likes of which the United States has largely – though not completely – eschewed since the end of World War II. It will have greater authority to attract and even coerce foreign investment in the US, often linking diplomatic support, security guarantees, and development assistance directly to how much market access and preferred treatment for procurement contracts US companies are given. At the same time, access to US markets, infrastructure projects, and procurement will narrow as “Buy American” provisions will increase. It also means that negotiations will always remain “live.” Trump has already put NAFTA, NATO’s article 5 guarantees, the European project, the OSCE’s Helsinki Principles, the One China policy, and the WTO back on the negotiating table. “Nothing is true and everything is possible” – the maxim once used to describe Putin’s Russia – could very well apply to Trump’s international agreements and partners abroad. Trump has an “axis of evil”, what he perceives as mercantilist countries masquerading as free traders and taking advantage of US openness and the public goods the US provides in the form of security guarantees, support for international organizations, and the dollar. Under George W. Bush in 2002, it was Iraq, Iran, and North Korea. Today it is China, Mexico, and Japan. Germany and the EU barely dodged inclusion on the list, but Trump and company most resent what they see as the bloc’s weakness and exploitation by Germany, and have hinted at an interest in taking a wrecking ball to the European project. For Germany and the EU, this means several things. On trade, the administration has stated it prefers to negotiate on a “bilateral basis”, in which the US sees itself in a stronger negotiating position. 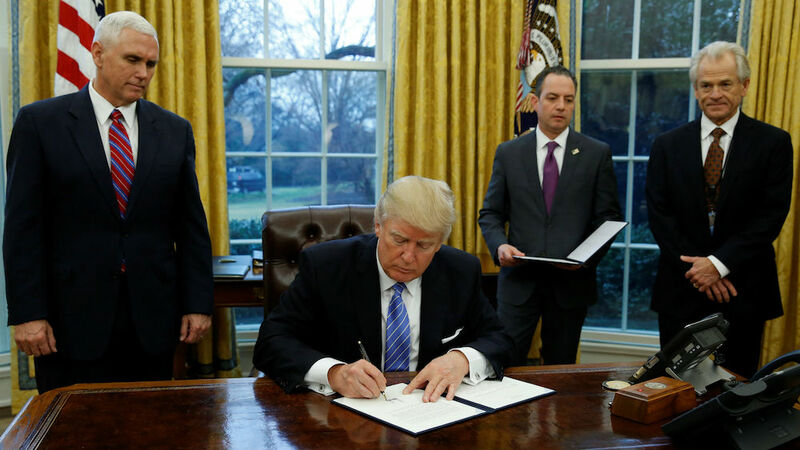 His first actions as president were to withdraw from TPP in the Pacific and launch a renegotiation of NAFTA in North America. With TTIP, Trump has not personally made his intentions known. The trade pact with the EU was not mentioned by either candidate once during the 2016 campaign. One thing is clear though: TTIP is not Plan A. Instead, the administration will start by probing the weak spots in European unity for cracks. Early outreach has focused on Europe’s populist reactionaries from the UK, France, and the Netherlands; Nigel Farage and Le Pen both met with Trump during the transition, and Geert Wilders was Trump’s guest at the Republican convention. The Trump team will also likely set its sights on Central Europe as the focal point of its effort to divide the EU on trade. The US has a number of pre-existing economic agreements, including bilateral investment treaties (BITs), tax treaties, and sectoral agreements with a number of EU member states in the region. The administration will likely attempt to reopen these agreements and fill them with regulatory arrangements, tax provisions, and market access that would undercut the Commission’s trade negotiating authority and exploit the power asymmetry of small states negotiating with the US. Trump’s economic team resents Germany’s privileged position within the common currency. New National Trade Council head Peter Navarro has stated that Germany has latched itself to Greece, Italy, and Spain in the eurozone to maintain a “grossly undervalued” euro that artificially inflates Germany’s competitiveness. In essence, they are priming the discourse for the administration and Congress to consider labeling Germany a currency manipulator by virtue of its eurozone membership. In early 2018, Trump will get the power to fundamentally reshape the Fed, including the chance to appoint a replacement for Fed Chair Janet Yellen. Most expect a full-fledged assault on the Fed’s independence. The likely outcome would be a weakened dollar meant to shore up domestic demand for US manufacturing and steel, often with negative consequences for German exporters. Trump’s affinity for Vladimir Putin is starting to translate into policy. While UN Ambassador Haley reaffirmed that sanctions on Russia for its annexation of Crimea would remain in place, no such guarantee has been given for sanctions in other areas. Already members of his national security team – including ousted National Security Advisor Mike Flynn – have moved to decouple sanctions imposed for the country’s invasion of Eastern Ukraine from the implementation of the Minsk agreements. Trump and Putin are expected to meet early in his term, and many expect a revival of frozen talks on a Bilateral Investment Treaty (BIT) between the two countries. A US-Russia BIT has long been on the wish list of US oil and gas companies, particularly ExxonMobil, which are looking to build out joint exploration projects offshore in Siberia and in the Arctic. This will be disorienting for German foreign policy, especially for the Social Democrats, who have tried to position themselves as both embedded in the West and a bridge between the US and Russia. Trump would like to cut out the German middle man – with implications for the EU’s sanctions policy, the future of the Normandy Process, the Minsk agreements, and the credibility of the OSCE. The administration’s largesse to Russia extends beyond sanctions. The Republicans working with the White House are ramming through a measure to kill a major anti-corruption law known as the Cardin-Lugar amendment that forces US companies from extractive industries – oil, gas, coal, and mining – to report payments made to foreign governments for all to see. The provision made it much harder for companies like ExxonMobil and others to bribe corrupt officials in countries like Russia, Libya, and Iraq, because payments could be tracked by civil society watchdogs. The EU followed suit with nearly identical legislation to “drain the swamp” of dirty payments from extractive industries. If the Republicans in Congress get their way, they will put Europe at a distinct disadvantage to US extractive industries, which will be tempted to go native with secret payments to authoritarian rulers like Putin and his cronies. Not all US industries are benefiting from Trump’s mercantilism, though. Policy is personnel, and the new cabinet is comprised almost exclusively of men from three areas – extractive and raw materials industry, finance, and the military. Noticeably absent is the tech industry, and the Trump team has taken an early shot at American tech with significant implications for Europe’s privacy standards. The Bannon-designed Immigration Executive Order contains a little-noticed provision that, by some accounts, effectively gutted the non-discriminatory treatment of European personal data by the NSA. The provision, known as PPD28, was the basis for a free flow of data agreement between the US and EU known as the Privacy Shield. If this is indeed the case, the bridge that allows digital trade between the United States and Europe could collapse, with serious consequences for tech, particularly for start-ups. The Trump administration’s formula – a reset with Russia and a pivot away from Europe – is nothing new. George W. Bush famously began his Crawford Ranch diplomacy with a glimpse into Putin’s soul and tried early on to pivot toward the Western Hemisphere before 9/11. The Obama administration’s reset with Russia – announced by Vice President Biden at the 2009 Munich Security Conference just months after the Georgia War – was coupled with a new pivot – economically, militarily, romantically – to young, dynamic, vibrant East Asia. Obama even famously cancelled the 2010 US-EU summit, complaining that meeting with EU leaders was akin to “a trip to the dentist.” Administrations’ early relations with Europe always seem to inspire one of two emotions: Republicans are hostile, Democrats are indifferent. Trump’s reset and pivot are qualitatively different. A Trump administration will both exaggerate these trends and make them more malignant. To the extent he has a preference for potential partners, it is for states run by authoritarian strong men that have succeeded in hollowing out their democracies, characterized by reliance on corruption, familial ties, opacity, kleptocracy, and an aggressive negotiating style where wins for both sides rarely exist. So what relationship can Germany and the EU have with a maximalist US that perceives Germany and the EU as mercantilist rivals? It’s time to look into a reset policy. To the extent that the US reset worked, it relied on areas where narrow interests aligned with a churlish, corrupt, and unreliable Russia. Germany and the EU must take the same approach to the Trump administration. Here are five ways to do so. Think interests rather than values. Agreements with the Trump administration will be constantly subject to threats of renegotiation. Trump has demonstrated that he is willing to put all settled arrangements back on the table. High-minded diplomacy will not be effective with the White House. It will require hard-nosed negotiations, clearly defined consequences for breaking agreements, and vigilance in enforcement, including automatic snap back measures when agreements are violated. Harden EU cohesion now. Mercantilist systems thrive on hub and spoke arrangements in which a country can exploit massive power asymmetries with its potential partners. The EU must put costs in place now for states that break rank on trade, the EU’s core competency. The EU Malta Summit was a good start. Forge stronger bonds with the institutions where the transatlantic values relationship still matters – Congress, the federal bureaucracy, US states, and civil society. Each will be constrained in its ability to influence policy, and insulated against the erosion of NATO, US-EU economic and security cooperation, and democratic consolidation. But they will be the foundation for the future repair of the transatlantic and international system. Use some showy public relations diplomacy. Trump will be more transactional than relational, basing decision-making in short-term, high-profile payoffs that can be easily communicated to his base, particularly white American workers in rust belt states like Pennsylvania, Michigan, and Ohio. This means European leaders need to emphasize every job added as a result of US openness and its relationship with Europe. Japan has already announced the intention to create 700 thousand US jobs as part of its geo-economic charm offensive. Europe should do the same. Stay rooted in the principle of reciprocity. EU economic policy, particularly access to procurement markets, has long been based on the simple, elegant position of same for same. The Trump administration will fight this, but will be hard pressed to deny it. is program director and fellow at the Aspen Institute in Berlin. Should the EU Save the Iran Deal?